While we were in Illinois, we learned that a very rare wanderer from Cuba had shown up in Everglades National Park. 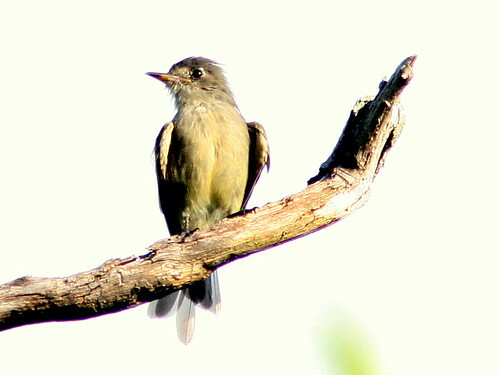 A Cuban Pewee (Contopus caribaeus), native to the Cuba and the northern Bahamas, and actually rather uncommon on parts of its home range, was heard and then identified on September 5 by Larry Manfredi. It was located at Long Pine Key, a camping ground in Everglades National Park. 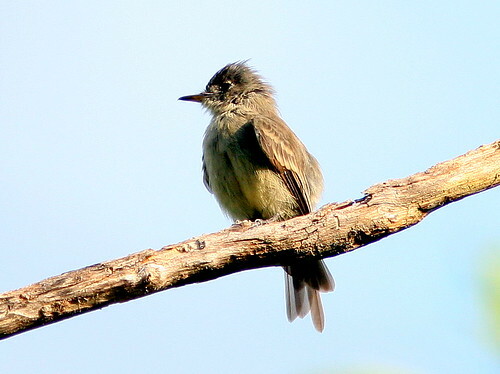 Only last week, I blogged about suffering “brain freeze” when I encountered an Olive-sided Flycatcher, also a member of the pewee genus Contipus. This was only the third time that this species was ever recorded in North America, and its first appearance in Everglades National Park. We held out little hope of ever seeing the bird, but it was still there when we returned to Florida. On September 13, Mary Lou and I took the one hour drive down to the Park, arriving at 7:00 AM, just around sunrise. We were soon joined by a few other birders on the same quest. Larry and other observers had earlier reported re-locating the bird within a fairly small area, at or near Gate 3 just off the road to the campground. The Pewee was said to be more vocal early in the morning, but we heard not a sound. By 8:00 we had spread out along the road, listening and looking, to no avail. Happily, at about that time, Larry himself came by, and within minutes he located the bird. Larry is an experienced expert bird guide. He is very familiar with the Cuban Pewee and was able to pick out its feeble “dee-dee-dee-dee” calls despite the racket being made by mockingbirds, woodpeckers, jays, grackles and numerous singing Pine Warblers. Read his trip report to the Bahamas at this link. The Pewee was in heavy molt. Its contour feathers were in disarray and new tail feathers were emerging underneath the few remaining old ones. Since molting requires so much energy, it is not uncommon for birds in molt to become more sedentary. Perhaps this accounted for its limited movement during the past week. My photos are a bit misleading, The harsh morning sun imparted golden tones to a plumage that, to my eyes, appeared more on the side of olive-gray. We, along with the other newcomers, including a lady who drove in from South Carolina, celebrated our new “lifer.” Back home, this was reason for us to update our spreadsheets of bird sightings. For me, it was the 576th species I have identified in the ABA North American area, and for Mary Lou, her 507th. I started listing my sightings in January, 1948, and it took me 53 years of birding to reach my 507th life bird, a Pine Grosbeak in January, 2001, in New Mexico. Mary Lou attained her mark in only a little over 11 years of birding! 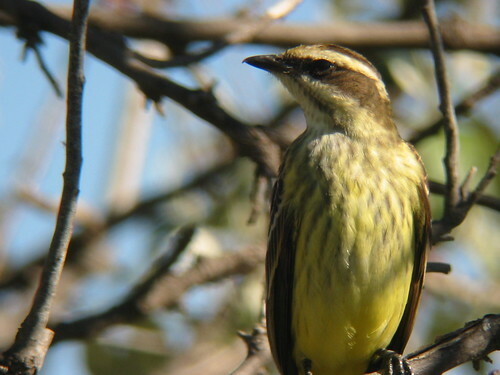 Back in 2003, we saw another “accidental” flycatcher at Bosque Redondo, New Mexico, a Piratic Flycatcher that had been reported in North America only three times previously. September 17th, 2010 at 8:09 pm Congratulations on the Cuban Pewee. I was there on Monday the 13th and the bird was located at 10 am. In fact I was leaving the area when it was found. I too had arrived at 7 Am coming in from a three drive from Ft Myers. We all waited the three hours. Had birders in from Michagin, Philly and a couple who just flew in from birding in Alaska. A good day.